Support for freedom of speech in Egypt has fallen significantly since 2013, according to a new survey, the largest of its kind in the Arab world. The annual survey, titled Media Use in the Middle East and conducted by Northwestern University in Qatar, spans seven Arab countries. It tracked regional media trends and attitudes towards free speech over the past five years. More than 1,000 people were surveyed in each of Egypt, Lebanon, Jordan, Qatar, Tunisia, the United Arab Emirates and Saudi Arabia in face-to-face interviews and by phone. The survey also incorporated the United States, where more than 2,000 respondents were interviewed. “It’s quite a representative survey. It’s very scientifically derived,” Everette Dennis, the dean of Northwestern University in Qatar, told Al Jazeera, adding that the sample size “is well ahead of what most studies would ever do”. The study found that while in 2013, roughly half (48 percent) of Egyptians said “it is okay for individuals to express their ideas on the internet even if they are unpopular”, only 29 percent agreed in 2017. According to experts, the figures are very telling of the regional changes following the Arab uprisings of 2011, when masses took to the streets to demand the downfall of dictators. The uprisings, which started in Tunisia, spread to five other countries – Egypt, Syria, Yemen, Libya and Bahrain – with a variety of outcomes. After ending 30 years of dictatorship under Hosni Mubarak in the 2011 revolution, Egypt saw the return of army rule in a military coup. 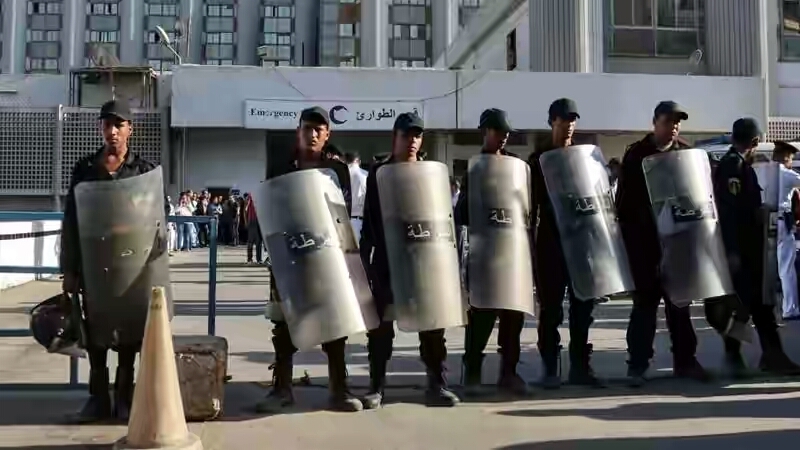 Under current President Abdel Fattah el-Sisi, a long-time military officer and former head of military intelligence, Egypt has taken an authoritarian turn and introduced repressive laws that limit free speech. Most recently, Egypt blocked more than 400 websites on claims of “supporting terrorism” and “publishing false information”. Commenting on the findings with regards to expressing unpopular views on the internet, Sahar Khamis, an expert in Arab media, told Al Jazeera: “This figure speaks for itself … There is overall an atmosphere of less freedom of expression, less freedom of the press, less freedom of opinion in the country. It’s not a secret. The figures on post-revolution Tunisia, on the other hand, seem to reflect positive changes in the country since the removal of former leader Zine El Abidine Ben Ali. Though far from perfect, Tunisia’s new constitution, signed after the uprising, was hailed as the most progressive in the region, providing more freedom to criticise state institutions. 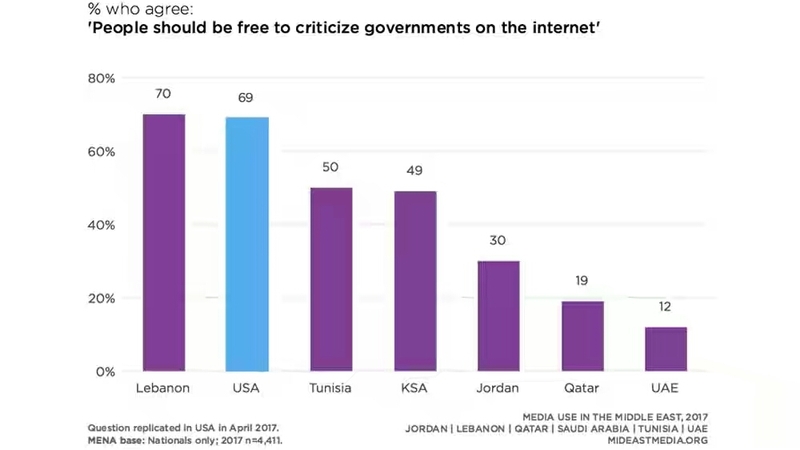 For the statement “on the internet, it is safe to say whatever one thinks about politics”, 44 percent of Tunisians agreed – the third-highest rate among the seven countries surveyed, after Lebanon and Saudi Arabia. Khamis said that Tunisia, which was able to create coalitions and witness a bloodless power transfer after its revolution, was – in contrast to the rest of the Arab countries that experienced uprisings – in a state of “nation-building and freedom building”. She attributed Tunisia’s successful model to the country’s high literacy rate. “They are creating a vibrant civil society model that allows for different opinions to be expressed and allows for diversity and plurality … This will inevitably lead to the Tunisian citizen feeling more comfortable to express their views”. Standing out from the crowd in terms of support for freedom of expression is Lebanon, according to the survey. The report found that seven in 10 Lebanese and Americans supported criticism of the government on the internet. In contrast with the rest of the Arab countries, tolerance for speech critical of government policies offline was also high in Lebanon, at 66 percent, and Tunisia, at 48 percent. In Qatar and the UAE, the figure stands at 21 and 14 percent, respectively. Beirut-based media commentator Halim Shebaya said that while Lebanon is more relaxed in terms of expressing views, “there is a fundamental difference in how citizens understand their right to freedom of expression and also how the legal system protects that right” in Arab and Western countries. In comparison with Saudi Arabia, Tunisia, the UAE and Qatar, Lebanon has the second-lowest rate of tolerance for speech that is offensive to one’s religion or beliefs, according to the survey. “Events have shown that many in Lebanon – and definitely other Arab countries – do not yet grasp the notion that freedom of expression includes the right to express views that may be shocking or offensive to others, especially on religious issues,” Shebaya told Al Jazeera.